2015 International Pipe Smoking Day Celebration!!! Please be sure to join your New York Pipe Club as we celebrate our Eighth Annual International Pipe Smoking Day (IPSD) Celebration! Celebrated the world over officially on February 20th, our event will take place on Saturday, February 21, 2015, from 3pm - 6pm. This year, we will once again be the guests of our good friends at Nat Sherman, 42nd Street, off 5th Ave., in NYC, from 3pm - 6pm in their Johnson Club Room. So, please make every effort to come on out and join us and while we are there, why not show our gratitude and support of our local brick and mortar shop by purchasing some of the many fine tobacco blends offered by Nat Sherman or perhaps even a brand new pipe - read on for special discounts extended to us to commemorate the special day! 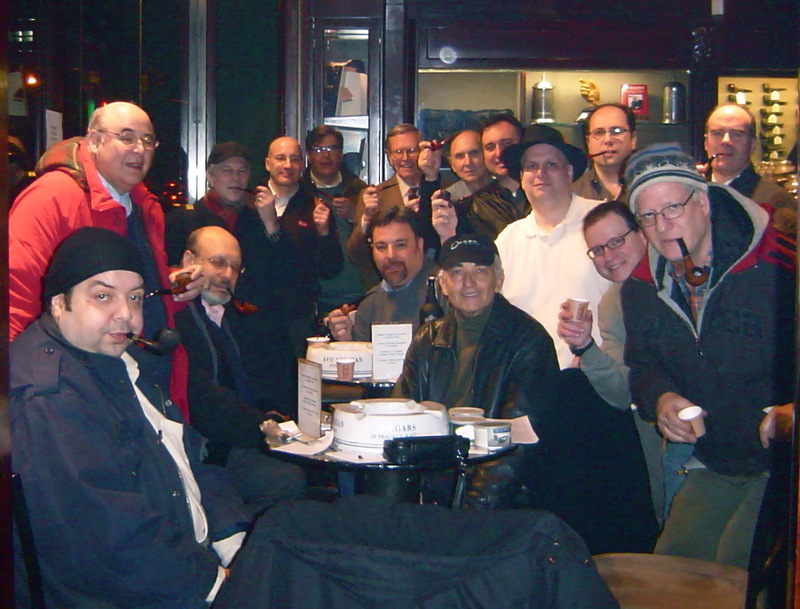 The New York Pipe Club invites all pipe smokers and those interested in the art of pipe smoking to join them in their celebration February 21st in the Johnson Club Room at Nat Sherman Tobacconist, 12 E 42nd St, New York, NY 10017(212) 764-5000, from 3:00PM - 6:00PM. We are cordially invited to remain in the club room until the store officially closes at 7:00pm. Our plan is to then, head over to one of our smoke friendly lounges for continued smokes, a nightcap and a bite to eat. The destination is yet to be determined, but Merchants East or SoHo Cigar Bar would be the likely spots. We will be attended to once again by club member, Chris McGrath, who will be our Nat Sherman retail liaison during the event. He's not only a club member but is Nat Sherman's resident pipe and tobacco expert and has worked tirelessly to promote Nat Sherman as the premier leader in NYC for pipes and pipe tobacco and has helped Nat Sherman to make a strong resurgence in the pipe and pipe tobacco retail category. After picking out your pipe or accessory, an additional discount will be picked offering another 10% - 25%! The NY Pipe Club will also be conducting a raffle or two so, come on out and give your luck a try! So, please make every effort to come out and join us and why not take advantage of the discounts and show our gratitude and support of our local brick and mortar shop by purchasing some of the many fine tobacco blends offered by Nat Sherman or perhaps even a brand new pipe! Would you like to be this happy? Then please join us at the Eighth Annual International Pipe Smoking Day Celebration on Saturday, February 21, 2015 from 3:00pm - 6:00pm at Nat Sherman.